Research and pilot plant production of thermally-sensitive materials often demand close control of temperature above normal ambient conditions. Since 1960, Harris Environmental Systems has worked with laboratory scientists and production engineers to develop warm rooms that deliver stable environments 24 hours a day, 7-days a week. Temperature gradient of 1.0ºC Max. Chilled water of DX cooling included. 3” thick, insulated panels with .0332” white aluminum skins. Narrow-range chart recorder, accurate to ±0.5% of the –5 to 55ºC span. Temperature deviations at the working height can make compounds unstable, media growth erratic and research results unpredictable. Harris warm rooms meet and surpass uniformity requirements of ±0.5ºC and maximum temperature gradients of 1.0ºC. The temperature is constant even when erratic transient heat loads are imposed on the space from process equipemtn and door openings. Research and production requirements are not always easy to predict in advance. Harris warm rooms are built with cooling equipment as well as heating elements, so the temperature control point can be re-set within a wide range as room use changes throughout the life of the facility. Productive research and manufacturing requires exceptional illumination and a quiet environment. Harris warm rooms are equipped with recessed fluorescent lighting fixtures which deliver a full 70 to 100 foot candle illumination at the working surface. Air handling systems are designed with components sized to limit noise to an average maximum of 70dBA – the level of normal human conversation. Harris warm rooms are equipped with extra capacity for unusual cooling and heating peak loads. Also, all Harris refrigeration systems have safety features such as automatic compressor restarts. These features help insure that mechanical difficulties do not endanger your operations. Unlike vendors which provide a limited number of standard-size rooms, Harris insulated panels are fitted to each installation. This means your limited space will be fully utilized for productive activity. In some cases, particularly where structural columns must be surrounded by the room enclosure, Harris custom-cut panels can increase floor space by more than 15% over rooms built with restrictive, standard panels. Unlike passive systems, Harris alarm circuits take action to mitigate an out-of-spec condition. When temperature exceeds a setpoint, the alarm advises room operators of the condition, but also shuts down all heaters. If temperature is too low, all cooling is automatically shut down, while the system provides audible and visual warning of the problem. Active alarms ensure that basic corrective measures are taken immediately. When the process is affected by ambient humidity, Harris provides a wall-mounted steam boiler with multi-point, counter-flow steam distribution, controlled by a digital humidity controller to maintain stable humidity conditions. Your projects can proceed with consistent, predictable results in any weather. As the temperature of air rises, it can hold more moisture. This means that maintaining 505 RH at 20ºC. Therefore, specifying a fixed relative humidity for a warm room will require the room supplier to provide a humidifier. The higher the realative humidity, the larger and more costly the humidification system must be. Most end users specify electric steam boilers rather than evaporative pad type or centrifugal atomizing humidifiers. Stem is preferred because the heat for evaporation of the vapor is carried in the stem flow, which avoids sudden temperature changes. Other humidifiers draw heat from the room air, which makes it difficult to maintain temperature uniformity. Also, atomizing humidifiers can generate dust if feed-water units can harbor microbial growth in the water reservoir if not cleaned frequently. To avoid these problems, specify steam-type humidification when high relative humidity is required. When specifying humidity control, be sure to require an insulated floor to prevent any possible condensation on cool concrete floors. Finally, when available, central steam systems can be used in place of dedicated boilers. This reduces both equipment and maintenance costs. Many find it difficult to understand why a room designed to stay warm needs cooling equipment. In fact, such equipment is essential for maintaining temperature uniformity and avoiding room stratification. The combination of heater control and adequate cooling capacity allows the room to hold uniformity at ±0.5ºC. Designers should specify digitally-controlled cooling equipment with a capacity equal to the anticipated heat loads if close-tolerance uniformity is important to the product or process. Standard surface finishes for warm rooms are baked white enamel on 0.032” aluminum. Stainless steel is available as an option, and typically increases the room cost by about 15%. It is best to specify wall and ceiling panel components, which are approved by UL and Factory Mutual and which meet BOCA code requirements for flame-spread limits. This will reduce the potential for local code violations, and does not significantly affect the cost of the installation. Since hot air rises, it can be difficult to avoid thermal stratification in a warm room, particularly if it is tall and narrow. 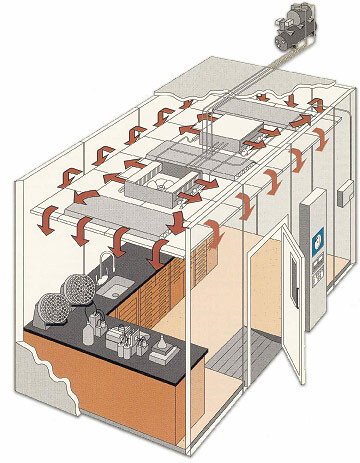 To avoid the problem, specify low sidewall air returns for rooms under 100 sq. ft. These pull the air from the ceiling down across the entire room. In larger rooms, perimeter air discharge through slot diffuser ceilings will provide uniformity of 0.5ºC without the need for low side-wall returns. However, when in doubt, specify low wall returns since they add less than 5% to room cost. In a warm room, low wall returns always provide better temperature uniformity than if air is returned to the center of the ceiling. Alarms advise room operators of fault conditions, but when specified, these circuits can provide other useful functions. For example, if the room goes above the temperature alarm setpoint, heating equipment should be shut off automatically. Active alarms can help prevent “runaway” conditions rather than just announcing that a problem is occurring, and should be clearly specified by the designer in critical applications. Harris also provides, as a standard feature, dry contacts in the control enclosure to connect alarm circuits to central monitoring systems. When this feature is useful, it should also be identified in the specification.